The question has come to my mind many times over the years and this month it has come to my inbox. Thanks to Pluto for inspiring me to write this article. The question: Is it possible to peer into the Business Objects XI CMS InfoStore (a.k.a. database repository) without Query Builder or the BOXI SDK???? Much of the meta data, the useful part especially, is stored in the CMS InfoStore in an encrypted binary format. No one has been able to decrypt this format yet, but I can’t really say that anyone has tried very hard. I certainly haven’t. The CMS InfoStore is mostly held in the database table named “CMS_INFOOBJECTS5”. Some other less significant data is held in the following tables: CMS_RELATIONS5, CMS_IDNUMBERS5, CMS_ALIASES5, and CMS_VERSION_INFO. The “properties”, “aliases”, and “objname” fields are where most of the goodies are to be found and these are the fields that are encrypted or in some way pretty much unusable to us without the SDK or Query Builder. Not all of these fields will have data, but some will and those that sporadically have data might meet your needs perfectly. I don’t really have a strong background in querying this table directly. So we are going to have to crack this nut together. Hopefully we can share our progress in the comments of this post and through updates from me to this article. If you look to the table structure you will see that the field lastmodifytime is of a character type and therefore it can be queried as presented above. 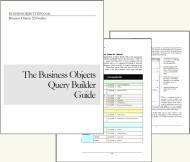 Why would you want to do this query directly on the database and not in Business Objects’ Query Builder? Short answer: performance and possibility. What I mean to say is that you can control more precisely the performance of the query you write against the table. In fact, a similar query done through Query Builder might perform so slow that you it would not be possible except if you ran it directly against the database table. The truth is that many valid reasons to directly query the database will still end up with you taking the output of that query and then running it through the SDK or Query Builder to obtain all of the properties corresponding to that output. What other database tables can I query? CMS_RELATIONS5 and CMS_VERISON_INFO seem to have the only other bit of useful data. CMS_VERSION_INFO has a single row with the repositories version info; I am not certain that you can detect service pack or fix pack level here, in fact, I think you cannot. The CMS_RELATIONS5 table seems to be interesting, but I have not come up with a useful reason to query it beyond tinkering. None of the data appears to be encrypted. It also appears to have almost a 1-to-1 ratio between its record count and the count of the objects in the repository as reported in Business Objects Central Management Console. The value of this table might increase if we were to discover the meaning of different relationshipid values. I cut and pasted the code above into SQL Server and there are a ton of Formatting issues/problems. Did you try the query in SQL Server? ALSO, as a bonus, the following code is the Crystal Syntax for a formula to convert the NextRunTime field to a DateTime field in Crystal Reports. I stumbled on this posting while searching for ways to query the Business Objects database schema. I’m specifically focused on trying to list the crystal reports, folders in which they are located and the sql (SELECT) stmt generated by Crystal for each report. I’m using BO 12 and SQL Server 2005. Is there any additional advice/guidance/scripts you would be willing to share or direct me to? I could totally be wrong, but the only place I know to get SQL is in the auditing data (if you have it enabled for Document Refresh). I am not sure if this captured for Crystal Reports though, I can only speak of WebI reports. Also as of BO XI R2 SP4 the path to the document is captured with each refresh (in the auditing data). So it would seem that I am saying the best place to get exactly what you need is in the auditing data. Of course, the limiter there is that the report actually had to be refreshed at least once after the auditing was enabled. Thanks, I appreciate the advice and the prior postings/sample SQL on this topic. Does someone know how to get ‘kind’ Information in InfoObject to know if a line result is for an User, a group, Universe, Document,…. ? There is a direct correlation between the database table field CMS_InfoObjects5.typeid and the logical field si_obtype. One day I went through all of the “kind” to find their “obtype” and then I mapped these to the “typeid”. This mapping table is in the Business Objects Query Builder guide that we sell here on this web site, so I won’t post the whole table. But I can tell you that CI_InfoObjects.si_kind "webi" = CI_InfoObjects.obtype "267" = CMS_InfoObjects5.typeid "267". If you need help mapping any other kinds let me know, or you could buy our little Query Builder guide and get teh complete mapping table and much more (a shameless plug, I know). Does someone has an idea about how to reset password of administrator account directly in le CMS database. I’m thinking that, if it is possible to decrypt CMS informations, maybe it is possible to do that. I am begineer to BO..I wanted to know about CMS..While googling,I got this link..But I couldn’t understand anything from these posts..My inadequate knowledge might be the reason for me not to understand that,,Still I would be grateful If anyone explains in my level of understanding..
Hi Asha, we all have to start somewhere. I will try and put together a small introductory article to help you and other like you get orienting more quickly to Business Objects XI’s general architecture. Thanks for the idea. I have used the below tool to get reports from the CMS. I also tested this one and was impressed on 1st look. Then I tested and had few queries; to my surprise, I got responded to my queries even before a ES rep does. Nice, small tool to make life simpler. Hi, I need to find users list who have scheduled reports for future dates using query builder. That is really all that you need, if the Business Objects report is a recurring instance than it is scheduled for the future. You might want more in the SELECT clause like the next run time or other properties. I need to create a list of how many users have been scheduling reports to public folders during last three months. can u please help me to find the above requirement using query builder. i am not aware of writing query.. I will certainly leave this for Julian; however, what you are looking for requires nested query. You firstly need to develop a query which will list all folders and sub-folders under ‘Public Folder’. Collect this information and use it in where clause of second query. This is not an easy request. I think you could create a schedule to a public folder and then analyze it quite a bit in Query Builder. You might find a trend that you could reuse on a broader scale. I wish your request were easier, but its not. how to find object id for the public folders…i mean in public folders having folders and folders having so many subfolders. do you want me to find object id for the public folders manually or do you want me write any query in querybuilder.if yes can u please let me know how to write the query for find the objectid for the public folders. How to identify using which client tool the user is connected to CMS e.g via designer, Deski, Webi Rich client etc? Hi Saranya, I don’t think that this attribute is captured in the auditing date, but I invite you to take a close look at all Audit_Detail records for a logon event and see if there is anything there. I can tell you that Query Builder won’t help at all with this request. Hi does anyone know if it is possible query the cms to show which objects in a universe are contained in which reports? I’ve also been trying to query for SQL held for each object in the universe. I used to be able to do this in 6.5 but have not been able to in XI R3. I REALLY need to write an article about this. I think this is the MOST POPULAR question that I see. For some reason, Google doesn’t help folks find the answer, so perhaps a dedicated article would help. The Answer: No, it is not possible in BusinessObjects XI or BI. The only way this is possible is through the auditing tables, but this requires that (1) document refresh auditing be enabled and (2) that someone has refreshed the report. Hi Amit, if a parent report is deleted all of the instances are deleted. Once deleted you cannot query them. Sorry. any knowledge or example about how to read the contents of the field CMS_infoobjects6.properties? Hi pleino, there is very little valuable information that you can obtain from directly querying the CMS_InfoObjects5 or CMS_InfoObjects6 physical tables. Most useful data in the table are encrypted. However, using either the Query Builder web application or the Business Objects Enterprise Software Development Kit (SDK) you can query the decrypted logical tables and obtain the information you seek. Is it possible to extract the information of tables that are used in universes? My requirement is to check which all universes are using a particular table. we have windows2003 based BOXIR2 infrastructure which has 4 servers in cluster Server1, server2, server3 and server4.In this server1 and server3 has event server, each server has 300 file paths mapped. Server1 has some issues in hardware..we are planning to move file paths from server1 to server3. Its very difficult to open each event and change the server.. so we would like to know..is there any way to change the server using SDK or bat files to change the server… thanks in advance. Hi Arasuu, you should be able to do with with the BO SDK, but I have not modified and even read events before with the SDK. Please look into this deeper and report back your findings. Thanks! Hi Divya, it is not possible to query the tables used in a Business Objects universe. This metadata is solely contained in the universe and NOT in the CMS InfoStore (the query-able metadata data source). It is possible to extract dims and kpis of universes or businesslayer and allocated infoobjects from bo_cms? Hi DCF, there really is not much that you can retrieve from the CMS InfoStore with regards to the fields of a report or universe. As I have recommended to others in the past, you either need to have some sort of Excel macro using the COM SDK that will pull in universe metadata or you need to look to your auditing data, which captures all of the fields used in a report (but does not flag them as dimension, measure, or detail). Hi Julian, I believe there must be a function to decrypt the data in the field ‘cms.objname’ since Query Builder shows the decrypted data. Do you have any information regarding this function. Hi Milan, Query Builder uses the BO SDK to decrypt the CMS’s metadata. Query Builder is just a handy SDK app that allows you to submit a query and receive the output on screen. I promise you that there is no DB function capable of doing this, just the BO SDK. Is there a way to obtain the FRS path for the contents of a deleted folder without using SDK? We had a situation where a user deleted a folder accidentally and now wants it restored. Unfortunately, while we can easily get the CMS DB restored from backup to a separate server, we do not have a test environment for BO at our disposal. This answer will leave me curious as to what you are intending to, by finding the FRS path of deleted items, they would not be available there; only folder structure will remain. To restore, you have to pull the backups of both FRS and CMS repo from same time. If above is not an option then try finding Repository Master from somewhere. Hope this makes sense… and I have managed to compile a complete set of the replace statements to do this correctly which I can post here later. Hi Steven, as you probably expect I am VERY eager to see the work you have done here. PLEASE do share a real-life example of how this works. We’d all love to see how you could pull information such as document name, document owner, creation date, and universe with just a single SQL statement (albeit one with many nested REPLACE functions) executed from a regular SQL client tool. Firstly; to remove any possibility of missing anything.. The SQL statement that I will post here (next post) will be structured to run on an ORACLE-based CMS platform. Some minor edits may be required for this to work if you run your CMS on any other platform such as SQLServer etc. THIS IS NOT A QUERY BUILDER query. This can of course be fleshed out to include other fields other than OBJNAME, But I’ve included a few examples of the nested replace functions, but keeping the query to a readable size. I also see a request for finding out what objects are used by a given report. This can be done also, but it does use third-party file explorer tools. The data is NOT stored anywhere in the CMS, but stored in the report document itself in the FRS. To obtain this information I use an application called Agent Ransack, which is a file searching utility. There should be a contents view window docked at the bottom of the screen, use this to view the contents of the file. It will only display lines containing the text ; therefore only show the object names used by the report. also, I should point out that the filenames returned are the filenames within the FRS which are like ~ce4145437612376.wid format; but I’m sure someone can figure out how to map the Report name to the filename 🙂 – anyone??? Sequentially running downwards like so. Great work in decoding the strings. Could anyone send me the queries for MSSQL to email bobjsql@seznam.cz (bobjslq at seznam.cz),please ? Obviously, it is not possible to copy/paste from this site. I have to correct the SQL, but some characters are still wrong – example after decoding “countrY o}T region o}T citY_dc_1”. I was not able to work with decoding from Steven at all :(, but only from user TF.